On October 26, 2011, close to 500 participants packed the Michigan League Ballroom for a symposium celebrating the 50th anniversary of the birth of Nonlinear Optics. The field of nonlinear optics was born in 1961 when the team of Peter Franken, Alan Hill, Wilbur Peters, and Gabriel Weinreich, working in the Randall Lab, observed for the first time the generation of optical harmonics. This discovery led to a revolution in optical physics that has opened up the entire electromagnetic spectrum, making possible laser generated radiation from terahertz frequencies to the X-ray regime. Applications of nonlinear optics range from fiber-optic communications to biological imaging and homeland security. 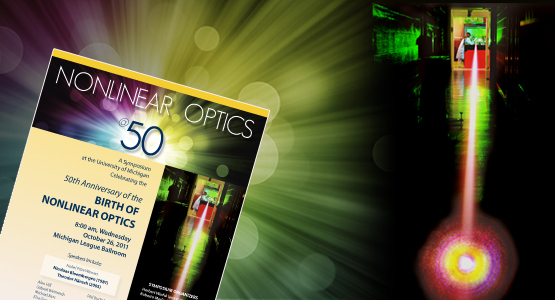 The discovery of nonlinear optics was just one of several Michigan “firsts” that occurred about fifty years ago. Among these were the invention of the glass-clad optical fiber by then-undergraduate Larry Curtiss. The technology he created forms the basis of all the fibers used in optical communication and medical endoscopy. Another Michigan “first” was the invention of practical holography by former EECS faculty Emmett Leith and Juris Upatnieks. Holograms based on their technique are now found everywhere, from credit cards to heads-up displays. The discovery of non-linear optics underscores the importance of involving undergrads in research, as Alan Hill was also an undergraduate when he made the observation of second harmonic generation. Other local connections to nonlinear optics included the co-discovery of stimulated Raman scattering in 1962 by an Ann Arbor native Robert W. Hellwarth (then at Hughes Labs), whose father Arlen had been a UM engineering dean and EE professor in the 1950’s and 60’s. Stimulated Raman scattering now forms the basis of fiber Raman amplification, an enabling technology for terabit communication networks. 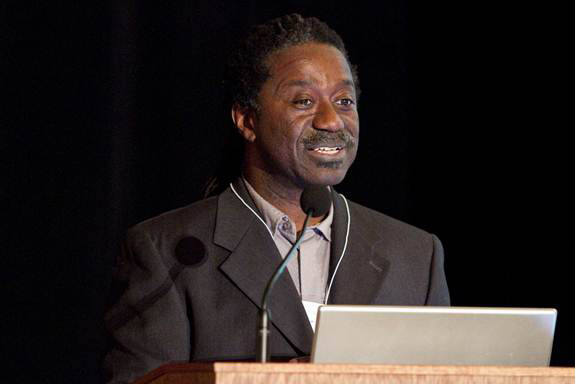 IMAGE: Professor Herbert Winful delivers welcome speech. Speakers at the symposium included physics Nobel laureate Nicolaas Bloembergen who described the history of nonlinear optics in the golden age between 1960 and 1962 when most of the fundamental discoveries in the field were made. His work established the theoretical foundations of the young field. He mentioned the invention of the ruby maser in 1959 by a U-M nuclear engineering professor Chihiro Kikuchi as one of the precursors of the laser that made nonlinear optics possible. The Michigan origins of nonlinear optics were recounted by Alan Hill, Gabriel Weinreich, and Michael Bass, all of whom worked with Peter Franken in making the foundational discoveries. Paul Maker and Robert Terhune, both of whom received their PhD in Physics from U-M, described their work at Ford Motor Company Research Labs, Dearborn, in the 1960’s which resulted in discoveries such as angle phase-matching and third-harmonic generation. Among the speakers with EECS connections were current professors Mohammed Islam and Tal Carmon, emeritus professor Gérard Mourou, and former ECE professor Margaret Murnane, now at the University of Colorado. Mourou, who was director of the U-M Center for Ultrafast Optical Science from 1991 till 2004, presented the Ta-You Wu Distinguished Lecture, the highest honor awarded by the physics department. In his talk, Dr. Mourou described how the enormous intensities made possible by chirped pulse amplification, a technique he invented, will enable laser-driven particle physics and the observation of nonlinear optical phenomena in the quantum vacuum. 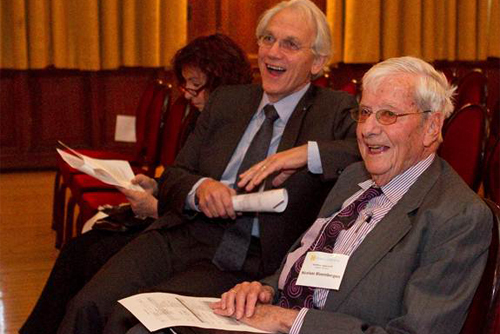 IMAGE: Emeritus ECE Professor Gérard Mourou (left) and Nobel Laureate Nicolaas Bloembergen at the Symposium. Other speakers were Joseph Giordmaine (ATT Bell Laboratories, retired), Elsa Garmire (Dartmouth), Marty Fejer (Stanford), Alex Gaeta (Cornell), Phil Bucksbaum (Stanford), Sunney Xie (Harvard), and Paul Kelley (Optical Society of America). A poster session allowed graduate students and research scientists to showcase their recent contributions to nonlinear optics. 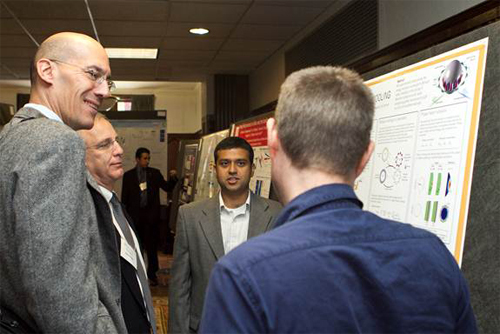 IMAGE: Poster session: Gaurav Bahl (facing camera), ECE research scientist and Prof. Tal Carmon (back to camera) describe their research to (from left) Profs. Alex Gaeta, Cornell University and Marty Fejer, Stanford University. 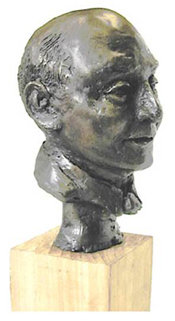 The symposium ended with a banquet at which commemorative busts of Peter Franken were unveiled. In attendance were the wife and three daughters of the late Peter Franken (1929-2001), Father of Nonlinear Optics (pictured left). The symposium was organized by professors Herbert Winful, Arthur F. Thurnau Professor, and Roberto Merlin, Peter Franken Professor of Physics and Professor EECS. Funding was provided by Electrical and Computer Engineering, the College of Engineering, the Physics department, LS&A, the Michigan Center for Theoretical Physics, the Office of the vie-President for Research, and the Air force Office of Scientific Research.